Tellagami: A New Way to Show Learning! The emphasis on incorporating technology can be overwhelming for teachers at times. With the plethora of apps, tools, and technology on the market today, it's difficult to discern the value of any given tool. 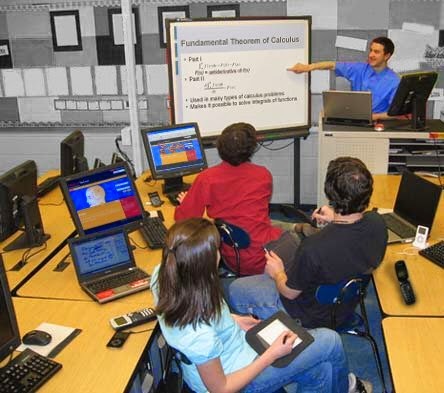 The technology you want to use may seem great but you really never know how the students will interact with it. This is why I always suggest that teachers try technology out for themselves before they attempt to incorporate it into their lessons. Tellegami is an app that you can master in literally 5 minutes. Even better, Tellagami fits perfectly into the 21st century skills framework. 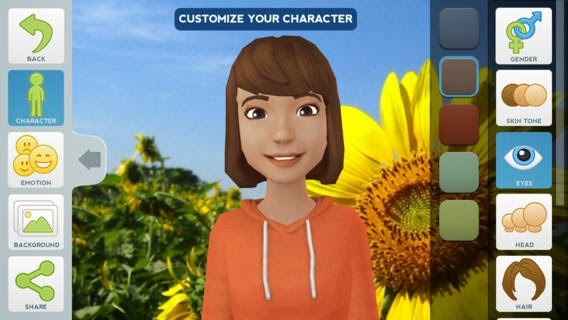 Sure, there are a great deal of apps that make teachers' lives more manageable, but vital aspect of Tellagami is that it will give your students the opportunity to practice their digital literacy. Customizable Avatar! You can edit your avatar's gender, skin tone, eye color, head size (weird right? ), hair color/style, clothes, and shoes. You can even select the emotion that the avatar will project while speaking your words (choices include: neutral, happy, sad, surprised, angry, scared, and silly). Choose the background. This is perhaps the most important factor in creating videos (or 'Gamis') to show student learning. If your students are reading a chapter from a book, you might ask them to make or find a visual representation of the scenery, take a picture of it, and upload it on Tellagami. This will show up behind your avatar. You also have the option of selecting one of their stock backgrounds. Place your avatar in a historic situation. save your 'Gamis' directly on your device. Even better is the fact that you can upload these videos to YouTube or iMovie. You can even have your students embed a 'Gami' into a Keynote presentation or a webpage/blog. I found that a really creative way to use Gami is to set up fake conversations with your avatar (ie. in each slide of a Keynote you can ask your avatar historical questions and program them to explain a historical issue/topic/theme). Like any app, Tellagami is not perfect. See below for some things you should know before choosing to incorporate Tellagami into your curriculum. Hidden Costs: Tellegami recently switched many of its avatar customizing options to 'in-app purchases.' For example, you used to be able to use one of 3-4 stock clothing top/bottom/shoe options but now you only have one option unless you purchase the "Character Customization Package," which costs $2.99 in the app store. Another example is the "Text-to-Speech" option. Before, you could choose to speak or type the words that you wanted your avatar to say. When typing text, you had the option of using one of 7-8 different stock voices, each with a different dialect, age, or gender. This option will now cost you a $1.99 in-app purchase. Many stock backgrounds are available, for a price, however as you have already seen, it's probably better to customize your own background with pictures from your device. Although it would be nice to customize your character for free, this app is about showing learning, not showing fashion sense. Time constraints: Videos are limited to 30 seconds. This is extremely annoying. No matter how concise you are, a 30 second limit makes it hard to make a good video. There is a workaround to this however. You can string together multiple 'Gamis' on an app like iMovie to create a longer film. This would be especially helpful if students are working in groups. Not available on the web. Wanting to use an app on the web may seem counterintuitive to the 21st century skills objectives (who wants to go back to computers when you have a device? ), however many schools are moving in the direction of 1:1 Chromebooks. Having the ability to access Tellagami on the web would make it easier for students to use this technology if they don't own a smartphone or tablet. The majority of computers have microphones and cameras in them, so why not make Tellagami available on the web? Overall, despite some of its drawbacks, Tellagami is still a fantastic app. A vital aspect of incorporating 21st century skills is giving students multiple options to show technological proficiency. Tellagami is just one of the many apps that I allow my students to use to show learning. The point of giving students their choice of app is that it places the responsibility on their shoulders. They can select one of many apps from a list but the results should be the same regardless of the app. The objective of any activity/project is to have students show their learning and I believe that, in this respect, Tellagami is one of the more useful apps in my students' educational technology repertoire. U.S. Primary Source Treasure Trove! The internet is a wonderful place. It's a magical wonderland that lets you find everything you could possibly need as a teacher. However, it's also an incredibly nebulous space in which useful information can get lost in the static. One of the main reasons I started this blog was to share my discoveries that would make life easier for social studies teachers. This is why I'm excited to share this fantastic resource with you fine social studies educators today! Enough with the babble, why don't we get started? But wait...there's more!! 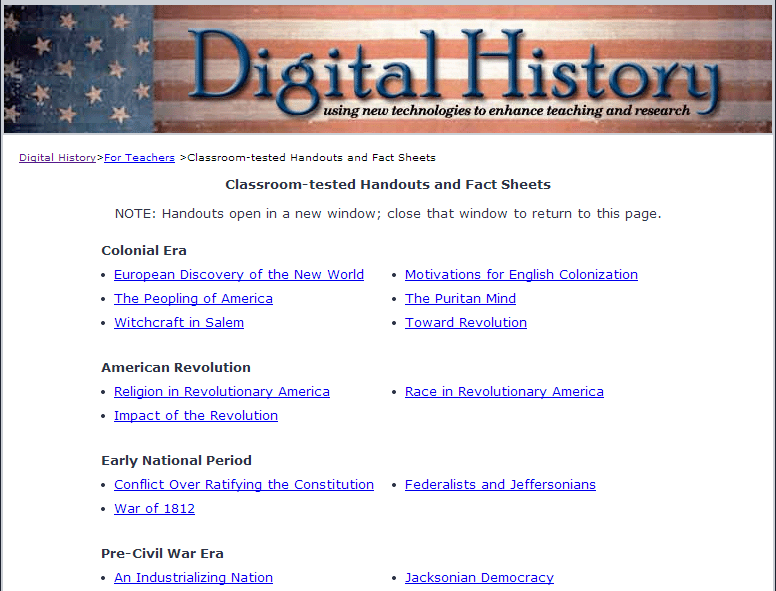 Not only does the Digital History website include thousands of primary sources, but within each historical era are sub-categories of specialty topics. Included are: a textbook, important events (in a timeline), important people (with links to their documents), famous music of the era, movies representing the era (and made during the era, if applicable), and images. You can also access a plethora of resources on specific topic. Some of the topics include: art, children's lives, and advertisements. This will give students practice at analyzing multiple mediums. History goes even further in making this my absolute favorite social studies primary source site ever. You can also access classroom-ready handouts and lesson plans that correlate with the primary sources. Overall, Digital History is simply the best archive for U.S. primary source documents out there! And the best part...it's all FREE!! 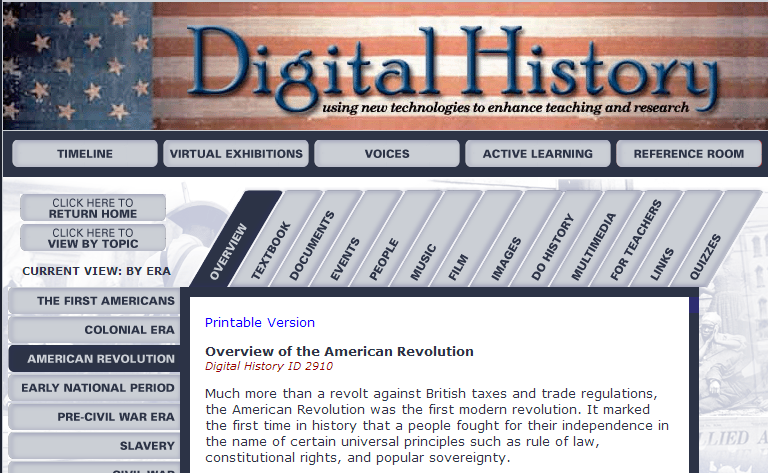 If you are struggling to find worthy primary sources to use in your class, Digital History is the place to go. So what are you still doing here reading this? You have thousands of primary sources waiting to be sorted through in order to make your class the best one students attend every day!! Oh, the dilemma of 21st century education. How can educators expect to compete with Xbox, Playstation, Facebook, Instagram, iTunes, or any other of the myriad distractions that teens are faced with everyday. In comparison to the exciting social networking world that students participate in daily, even the best efforts of educators to make their content exciting only serves to produce an unbearable ennui for students, who are constantly engaging in the much more exciting world of communicative technology. The dilemma then, is to make the content as interactive as possible. Students want the freedom to make their own decisions. In the words of Erikson, an adolescent must be given the necessary freedom to create and/or experiment with their own identity, or they may become susceptible to identity confusion. This this is where Mission US comes into play (literally). Mission US is "a multimedia project that immerses players in U.S. history content through free interactive games" (http://www.mission-us.org/) Through partnerships with the National Council for the Social Studies, the National Endowment for the Humanities, and the Corporation for Public Broadcasting, this website provides interactive games that give students a fun experience and concomitantly allow them to develop the deep understanding of content knowledge that teachers so desire. A few years ago, I had the opportunity to present a workshop at the Montclair State University summer professional development conference. The topic of my talk? Using a feed reader to grow your Personal Learning Network. If you haven't heard of feed readers, or have but don't know how to use one, this is the post for you! How many of you know 'that' teacher in your school? You know the one, he/she is always finding the newest educational technology. This teacher is often envied by the staff and cherished by the administration. They are the ones who always seem to come to staff meetings with some new ed tech app or tool. You might think to yourselves, "where does this person find the time to discover all of these great resources?" "Technology is great, but it doesn't beat experienced, expert teaching," you might think to yourself. You know you've heard that one before, and you know what? It's true! However, isn't there a way to be an expert teacher who also incorporates technology into the curriculum? The keynote speaker at the conference spoke of the 'tyranny of OR' which posited the idea that too many people surrender to the assumption that you can either have this OR that, good teaching OR educational tech. Well, I'm here today to tell you that you can in fact have both. Today, I will share my secret of how I became 'that' teacher and it's much easier than you might imagine. I would love to share a wonderful website that I have become obsessed with over the past few months. The site is called iCivics, and contains some really fun games that assist students in learning about various civic duties and processes, while concomitantly captivating the audience (you, your students, or other friends who are interested in American values). Ok, so maybe this site isn't for everyone, and as a social studies teacher, I may have more enthusiasm than the rest of you; however that does not discount the fact that it is a fun and educational game (and here you thought that the terms 'fun' and 'educational' would never belong in the same sentence). The site was developed with the help of Sandra Day O'Connor (yes, that Sandra Day O'Connor, first female Justice of the Supreme Court) and produces tons of online games with corresponding lesson plans for teachers. A few of the games that I have played and highly recommend are: Executive Command (you get all of the power...and responsibility, of being the POTUS) and Do I Have a Right: Bill of Rights (you are in charge of a law firm and you must learn the Amendments in order to refer clients to the right lawyer in your firm). These games last about 20-25 minutes and can be played on any computer with internet access. The games are also scored and allow students to print completion certificates so they can compare their scores with others in the class.